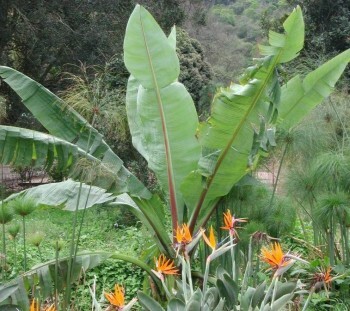 This relative of the edible banana is a valuable landscaping plant. Its form, texture and large leaves with conspicuous red midribs, create a lush, tropical effect. Ensete ventricosum is a large, fleshy-stemmed plant with a head of banana-like leaves. The plant grows between 6 and 12 m high. It is a monocotyledon and does not have a true, branched trunk, but an unbranched pseudostem formed by the imbricated (overlapping) bases of petioles (leaf stalks) left behind when old leaves die. The pseudostem broadens towards the base. The plant seldom forms suckers from the base. The simple, large leaves, up to 5 m long and nearly 0.9 m wide, are oblong to oval and have a thick, rose-pink midrib and numerous pinnately parallel nerves extending to the margin. They are spirally arranged at the tip of the bare trunk giving the plant a rounded crown. This plant flowers and bears fruit once only in its lifetime and then dies. The flowers form a large, showy bunch or spike 2 to 3 m in length. The male flowers usually occur at the tip and the female or bisexual flowers lower down. The cream-coloured flowers have only one petal, but are surrounded by large, showy, maroon bracts. Flowering usually takes place in early summer (October and November) and the flower spike is on the tree for a year or so. Insipid, banana-like fruits form about half way along the flower spike after flowering. They have a yellow skin with black spots and contain a row of pea-sized, hard, black seeds. Under normal conditions plants flower when they are about eight years old. The plant is found in the frost-free areas of Limpopo in South Africa and also occurs further north in Africa. It occurs in patches of high-rainfall forests, in forested ravines and along streams. The genus name is derived from the Ethiopian name for banana. The specific epithet ventricosum means 'with a swelling' and refers to the swollen base of the pseudostem. There are about 25 species in the genus, most of which occur in the Old World tropics from Africa to Asia and New Guinea. Only this one species occurs in South Africa. The flowers are visited by bees and other insects, which bring about pollination. Aside from its horticultural value, this plant has many traditional uses. It belongs to the same family as the edible banana, but its fruit is not edible (or is only eaten in times of scarcity), but young inflorescences are palatable and are eaten when cooked. The pea-sized seeds are said to be the famine food in some other countries like Ethiopia. The pulp in the pseudostems and rootstock is also eaten. The seeds are also used as beads, and to make rosaries or rattles in East Africa. The leaves can be used for thatching and the stalk to make fibres for cordage and sacking. Ensete ventricosum cannot tolerate heavy frost. In areas that experience frost, it should be planted under big trees in order to protect it or brought inside for the winter if grown in a pot. The species can be propagated easily by seed. It requires warmth, lots of water and fertile soil to grow to its full potential. Mabberley, D.J. 1997. The Plant Book. Cambridge University Press, Cambridge.